Holistic Living Annex: How Important Is It To Check Yourself For Skin Cancer? How Important Is It To Check Yourself For Skin Cancer? (hla) According to the statistics provided by the Centre for Disease Control (CDC), melanoma (the deadliest form of skin cancer) has been increasing by 6 percent annually. Only 18 percent of women was reported to schedule for an annual skin check with a qualified medical doctor. L'Oreal Paris also reported that 88 percent of women have never discussed the condition with their doctors and only 30 percent of them conduct a monthly skin self-exam as recommended by the Skin Cancer Foundation. 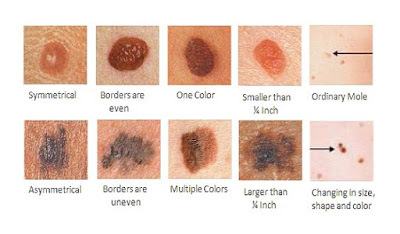 Although melanoma, originating from the pigment-producing cells (melanocytes), is the least common type of skin cancer, it is the most aggressive and most likely to spread around the body. It can also become fatal when left untreated. In fact, according to the data illustrated in the report "Early detection and treatment of skin cancer", majority of the deaths related to skin cancer is due to melanoma. The World Health Organisation (WHO) reported that about 48,000 cases of melanoma-related deaths occur worldwide each year. To treat melanoma, one usually requires surgical removal of the tumour. Detected early while it is still small and thin, the chance of curing melanoma is high if it is completely removed. The likelihood of melanoma recurring would depend on how deeply the tumour has penetrated into the layers of the skin. Chemotherapy, immunotherapy or radiation therapy may be required to treat melanomas that come back. Examine your body using the acronym 'ABCDE' to identify suspicious moles. Carefully examine your forewarms, undermars and palms. Your palms and the bottoms of your feet and nail beds are places where you are very likely to get acral lengtiginous melanoma (ALM), a type of melanoma that affects people of colour more than any other group of people. Remember to check the back of your legs and feet, the spaces between your toes and the soles of your feet. It is also important that you check your fingernails and toenails too. Unusual pigmented bands on the nails could also be a sign of cancer. In the event that you spot a vertical lien in any shade of brown extending from the cuticle to the tip of your fingernail, double-check with your dermatologist. Check the back of your neck and scalp as well. You can either use a hand mirror or get a partner to examine your scalp for you. Although less than 6 percent of melanomas pop up on the scalp, they can be deadlier because they are often discovered only at later stages. Use a hand mirror to examine your back and backside. A dermatologist in New York City and author of Skin Rules Debra Jaliman reminds "(not to) wait to get a mole checked because you never know what it could be." Sometimes we dismiss these marks on our bodies as mere pigmentation. How can we differentiate a mere harmless pigment from a harmful one?